Your body has spent most of its life burning sugar for fuel, now that you are cutting off its accustomed fuel supply, there will be some transitional things you need to be aware of. You body stores glycogen in water in your muscles. This means that as your glucose levels fall as you cut out the sugar and carbs, your body will begin to use that stored glycogen as a last-ditch source of fuel. As the glycogen is used up, the water it’s stored in is dumped out. Don’t be surprised if you are in the bathroom a lot more than what you are used to and you lose 10+ lbs the first week. Some of that will be fat but most of it will be water weight. Your body is addicted to sugar and when you remove it from your diet, well what happens when a heroin addict tries to get clean? 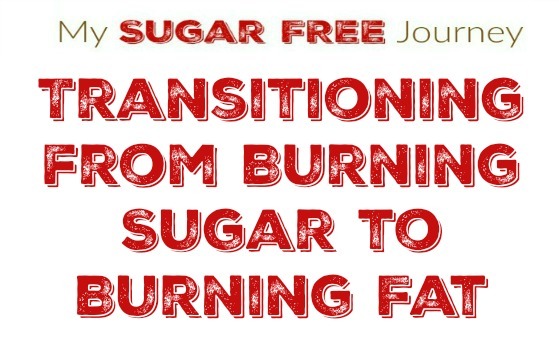 It’s not the easiest transition to make and is why it is so important that you remove all sugar and carbs from your home before you start. We will look in a few days at just how addictive sugar is but for now, just know you will experience “drug seeking” behavior. Stay strong, this will pass. As the old fuel source for your body dwindles down to a trickle, it takes a little time (3-5 days) for your body to make the switch over to being run with ketones instead of sugar. I’m not going to lie, this transitional time can be tough. You might feel fatigue and lethargic as your muscles are depleted of their glycogen stores. You might experience mental fogginess because the glucose levels aren’t where they should be and your body hasn’t ramped up ketone production yet. You could also experience mood swings as your hormone levels begin to adjust to their new reality. When my 88 year old Mother in Law switched over she spent a few days in bed with flu-like symptoms. Nothing life threatening (She is 88 years old after all.) but she just needed to rest. To ease this transitional time and to greatly shorten it, there are 3 things you need to do. As the glycogen stores in your muscles drop, they take a lot of water with them. That water needs to be replaced. Try to up your water intake to at least a half gallon a day if not a gallon. Salt is another one of those things like fat that has gotten a bad rap. Did you know we are the only animal that tries to limit its salt intake? Unless you have terribly high blood pressure, you will want to increase your salt intake, especially during this transitional time. This will allow you to retain more water and make you thirsty so you will want to drink more water. Consider getting a more natural salt like sea salt or pink himalayan salt as these salts generally have more trace minerals that have been stripped out of typical table salt. If you find yourself getting hungry, that usually means you aren’t eating enough fat. This is a common problem as most people have had a fear of fat drilled into them over the years. A ketogenic diet doesn’t work without fat as it is the fat that makes you feel full and keeps you from overeating. Don’t be afraid to put butter on your veggies or heavy cream in your coffee. Ok, I said there were only 3 things you need to do but there is a 4th option available but I need to stress that it is entirely unnecessary. You can take these ketone supplements to bridge the gap between your low blood sugar levels and when your body will begin to produce its own ketones. Again, it’s not necessary but if you are experiencing the fatigue, mental fogginess, or mood swings to an extreme degree or just don’t want to wait until your body starts making its own, you should consider picking some up and experimenting with it. Where can we purchase ketone supplements? Where do you buy ketone blood tester? The ketone supplements are linked in the post and if you just go to amazon and search for blood ketone tester, you can find it. Here is a link to the breath analyzers.